Texas finds itself the site for many events from 1527 to the present, including the Battle of the Alamo. A richly compelling novel of a proud people eager to meet the marvelous challenge of the land, Texas is Michener's most magnificent achievement. This re-release of Michener's masterpiece ties in with the up-coming mini-series. This wasn't as good as some of his earlier works, so I was disappointed. Still, it was an interesting read. One of Michener's best efforts. Historical fiction with the rich landscape of Texas as the subject. Even though I'm just now half way through this, I don't regret starting it! I just regret that I probably won't finish it before class starts again. Michener's stuff is so fascinating! And a cool place to learn about, considering American politics these days. Interesting to understand the "spirit" of the people and place. Enjoyed the book from start to finish. Michener’s novel is about oil, water, outlaws and rangers, Hispanics, Anglos, settling the frontier, power and money. He has masterly made history vivid and real to the reader. A good trip into the history of Texas, from its start as a Spanish mission to its days as a republic to present day. Michener's style is a bit stale, but he does keep the reader entertained enough so he doesn't lose him.Pack a lunch though with this one its a long trip. 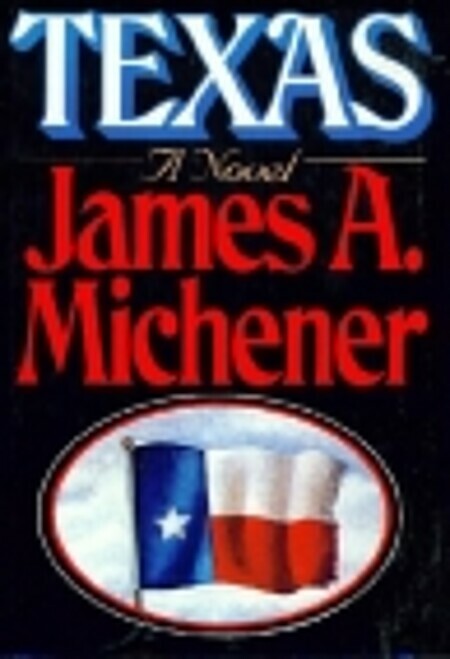 Texas is James Michener's panoramic treatment of the history of that region of North America , beginning in 1535 and ending in the mid 1980's when the book was published. I have read a number of Michener's other works of fiction in the past, including Centennial, Chesapeake and The Covenant, but it has been nearly 30 years since I picked up one of his books. Michener ably combined a mixture of true events and people with fictional characters and circumstances, crafting a survey of the development of Texas that was both broad and focused. As an example, he discussed the development of cattle ranching that had a wide-angle view, as well as looking at the specific situations of several people involved in ranching as their primary vocation. In a similar fashion he walked through the significant portions of Texas history and development, such as its time as a part of Spanish Mexico, its independence as a Republic and settlement during and after the Civil War.